Japanese Episode AG 062: "Shidake Taun!! Pokemon Kontesuto!!" American Episode 334: "Disguise Da Limit"
The day of the Shidake Town Pokemon Contest has arrived! Kimimaro has managed to sneak out of his house to compete, and Shuu has come out as well to view the competition. Before too long, the Contest begins. First up is Musashi of the Rocket-Dan, disguised as a Coordinator named Musashinovitch. Musashinovitch and her Dokukeiru impress all the judges, earning her the highest score of the appeal round. Haruka's turn comes up soon, and the young trainer and her Eneko start things off with a Blizzard attack. The attack fails, however, costing Haruka enough points to make her doubt her ability to continue into the next round. After Phantom's turn comes and goes, the top four are announced; Musashinovitch, a Kameel trainer named Shigeki, Phantom, and Haruka! 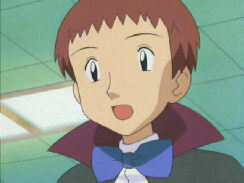 The first match of the finals pits Haruka against Shigeki, whose pokemon quickly loses to Haruka's Eneko. Next up is Phantom vs. Musashinovitch. Kimimaro's mother, who had been dragged to the Contest by her husband, watches her son fight against Musashi's Dokukeiru. She sees how passionate her son is about pokemon and begins to rethink her position on the creatures. Phantom eventually comes out on top, leaving the deciding match to be between Haruka and Kimimaro. None of Eneko's normal-type attacks work against Phantom's Samayohru, so Haruka is forced to rely on Eneko's imperfect Blizzard attack and its Assist attack. Haruka gets lucky and uses Assist to wear down Samayohru, but Phantom won't give up! Suddenly, Phantom hears his mother cheering him on from the audience, giving the young Coordinator a boost of confidence. Phantom removes his mask and resumes the battle as Kimimaro, but Eneko is still able to pull through with a victory. With Haruka's final opponent defeated, the young trainer earns her second Contest Ribbon! As Haruka proudly holds up her new ribbon, she thinks of how she's that much closer to the Grand Festival. I really only have one thing to say about this episode: Haruka did not deserve to win her second Contest Ribbon. The whole Contest was preposterous, in my opinion. Haruka gets a really pitiful score in the appeal stage, yet she's allowed to continue into the finals? Was the competition really lacking that day or what? Then we get to the finals, where Haruka's pokemon gets hit by a Focus Punch, two Will-O-Wisp attacks, and two Hyper Beams without even look winded. Meanwhile, Eneko deflects a few attacks then hits it with a Blizzard attack, yet Haruka's pokemon is the one who comes out on top? What is up with that? There were other oddities that sort of nagged at me as well. Why does Nyasu have his own seat in the audience? I mean, did the Contest organizers not have any issue selling a ticket to a pokemon? 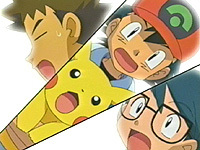 Also, this is the second Contest in a row where Satoshi uses his Pikachu to attack one of the Coordinators on-stage. Maybe it was overlooked in the Kaina City Contest because it was revealed that Musashi had been cheating, but Musashi didn't do anything wrong this time. Why aren't the people in charge of the Pokemon Contests keeping an eye out on this trainer who's traveling around, using his Pikachu to electrocute people on-stage? The dubbed version is much less edited than the previous episode, so it returns to its usual standard. Apparently the dub gave Vivian a last name (Vivian Meridian? ), but it's nothing to cry about. Three seconds are cut from the opening pan shot of the episode. During the recap of the last episode, all the shots of Kimimaro's pen are altered to get rid of the Monster Ball design, just like it was in the last episode. You'll have to take a look at the last episode comparison to see pictures of what I'm talking about. Right at the beginning of the locker room scene where Kimimaro's father tells our heroes about his wife's beloved Pochiena, there's a two-second shot of Kimimaro that's cut from the dub. In the Japanese version, the fifth opening theme to the first series, Ready Go! (aka the most overused song in the anime ever) plays when Haruka commands her Eneko to use Assist during her final battle against Kimimaro. In the dub, it's replaced by dub background music. Two seconds are cut right after Kids' WB! 's final commercial break. Finally, three seconds are cut from the TO BE CONTINUED... screen.